Last free BOM link is open! The Fan Flower link is now open. This is block 42 and is the last in the Vintage Sampler series. Whew! It has been a blast to design and share this pattern. One would think writing 42 block patterns would be a real task, and it was. But I action wrote 126 patterns because I did three versions of each block. OMG! Thanks to all of my great followers and newsletter readers who have faithfully followed this BOM. I am going to start a new one next month, and no hints will be given as I am still working out the details. Once this BOM closes the whole Vintage Sampler quilt will be available for purchase as a complete pattern only, and the 12" and 16" versions of the block, available only to my subscribers, will no longer be available at all. 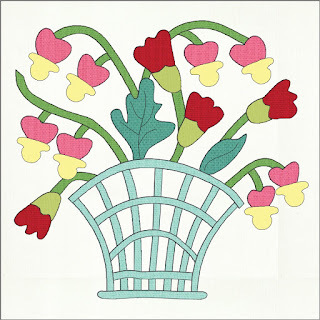 I am introducing two new patterns this month which will be available from my publisher: Quiltwoman.com. They are made featuring the Jo Morton fabric line Dovetails I from Andover Fabric. The first pattern is called Pave the Way. 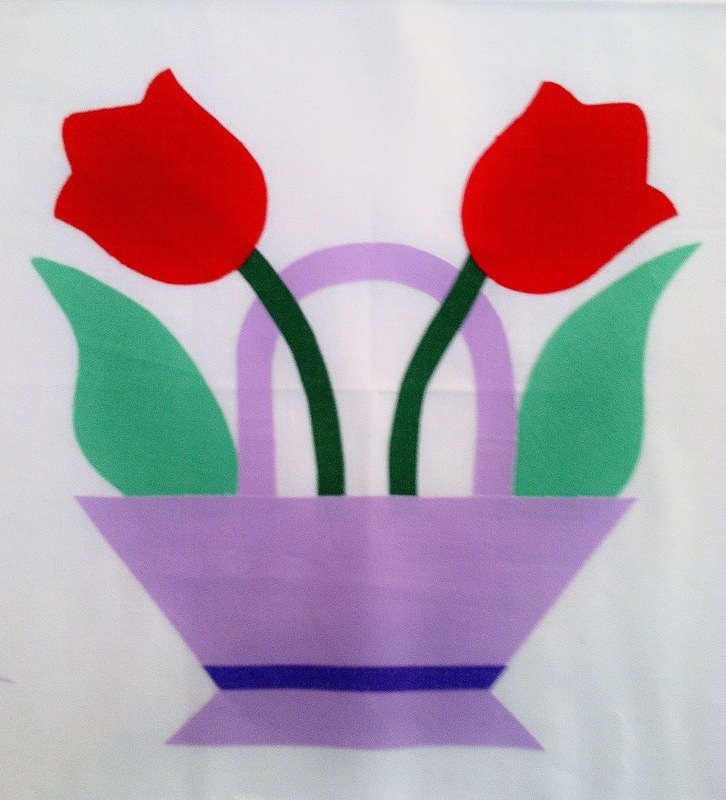 It is actually pretty simple as it features plain background blocks and all the design is fusible applique! 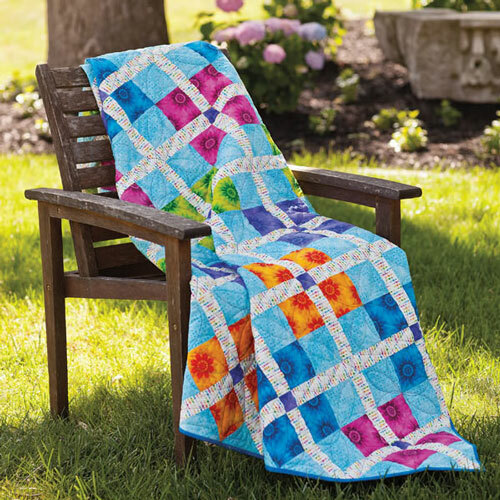 The second pattern is called Temple and is a combination pieced and applique quilt using the same line of Jo Morton fabric. If you are interested in being a pattern tester -- and have a high level of piecing and applique skill AND the time to complete a top in a relatively short time frame -- please let me know. I have a lot of patterns which need to be tested before they can be published. Stay tuned for more new designs. 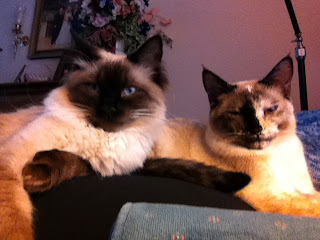 On the home front, the kitties are as crazy as ever. Clear evidence that they are possessed! Buffy is sitting on Buster's tail and Buster is sitting with his feet on either side of Buffy giving her a back rub, looking like a total dweeb. And Rockie, our yellow lab, trashed my office yesterday while I was gone in an effort to climb onto the table behind a set of boxes where the cat food is hidden. 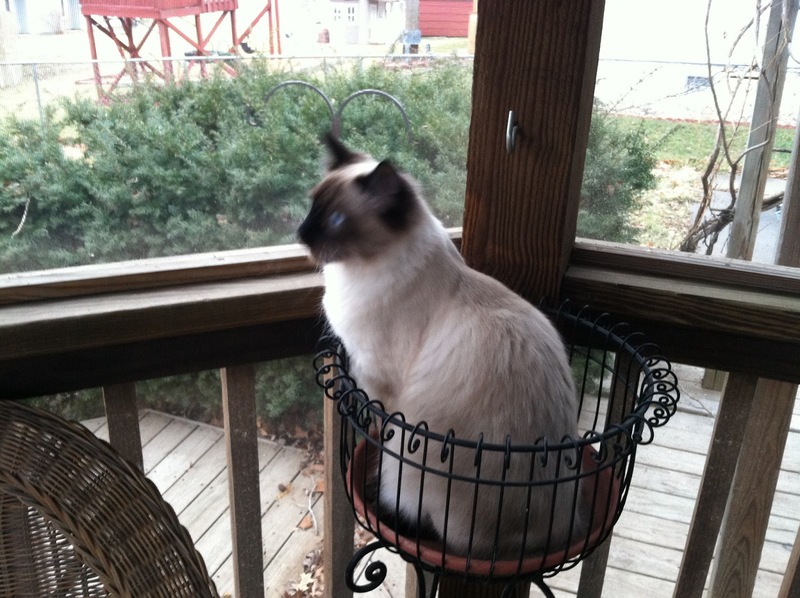 We had just filled the cat food canister and Rocky ate the whole thing. When we got home his stomach was bulging and the cat food was GONE. The most damning evidence, however, was the complete chaos he made of my office knocking things down in his attempt to get at the highly ingenious secret location of the cat food. . . not so secret anymore. Damn dog! Ok, hope your weekend is going great and you are enjoying this wonderful fall Kansas weather! It has been nearly 2 years of working on this applique quilt and I am so ready to get it assembled and on to the quilter. My blocks are done and I am doing a bit of embellishing and will assemble the complete top in the next few weeks. 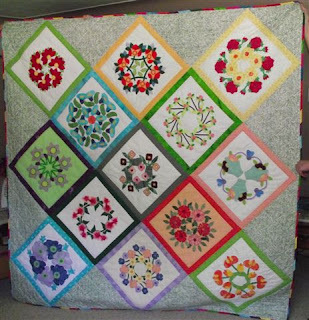 This fabulous quilt is made using the 16" blocks which were available for free to my newsletter subscribers. I love your colorful frames around the block and simple setting triangles to finish it off. What a great way to use 15 of the blocks. Notice she made 2 different versions of the basket block and set them on point across the top as a pillow fold. 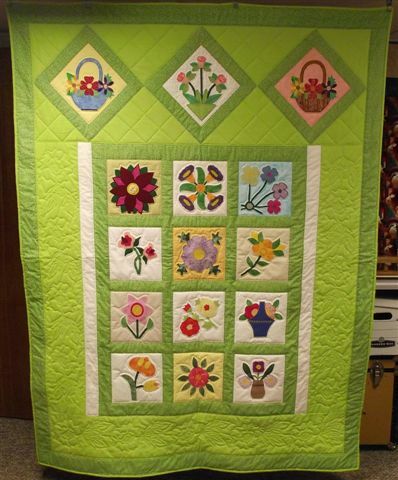 Very creative, and some great quilting too! 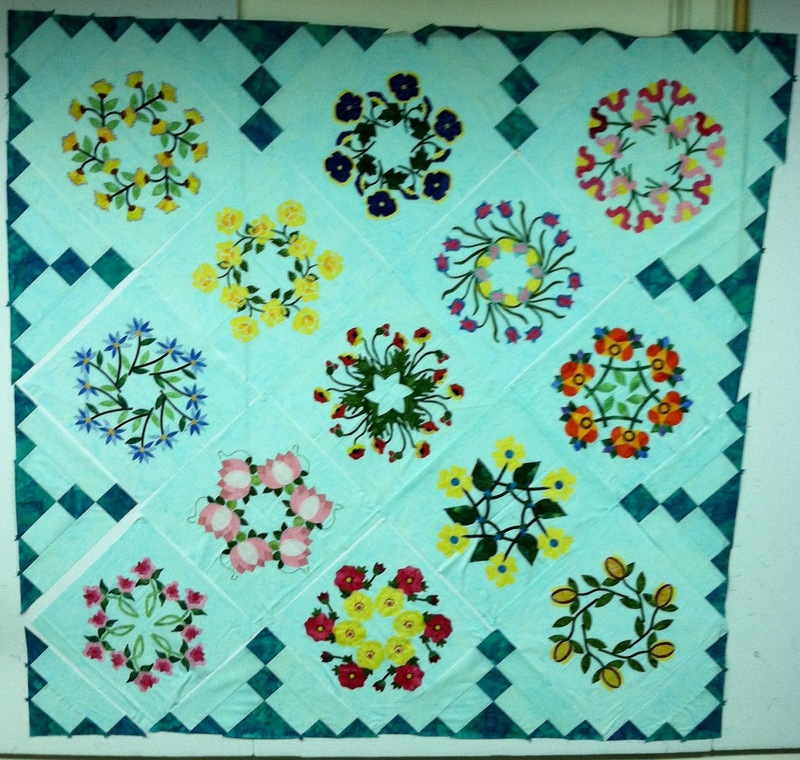 This is Betty's most recent quilt suing some of the last series of blocks. She sure love those green borders! But what a fun way to showcase just 9 blocks in a great lap quilt. This adorable on-point setting using the 12" blocks from the newsletter. 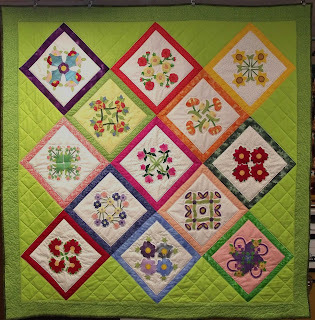 They are just adorable and the cross-hatch quilting really is nice with the motion of the blocks. Those 16" wreath blocks just really pop in this setting. Notice how she used different color backgrounds in the blocks. So creative and beautiful. So far Betty has 5 completed quilts from this BOM!! That has got to be a record, and I bet she has more coming since she made all 42 of the blocks in all 3 sizes for a total of 126 blocks + several duplicates that appear here and there. And she wan't afraid to play with different colors than the ones I selected, and I just love her choices. Way to go Betty!! 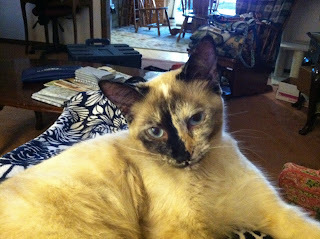 OK, here is the latest kitty update. Those dratted cats are just about as crazy as a siamese can be, and they are pretty much working on all 9 of their lives! I just returned from Oconomowoc, WI (yes, it really is spelled like that ) where I taught EQ7 classes at the Machine Quilting Today show. Go on, just try to pronounce that. I had to ask a local for the correct pronunciation. I was only able to stay 2 days so I missed the quilt show and vendor mall. Drat. But it was a fun trip, and now that husband Bruce is retired I have a driver and porter to haul my stuff around. Ahhhhh! The best news of all, is that my darling new daughter-in-law Jess is pregnant! I am going to be a grandma at last! She and son Eric are expecting in late January and we found out this week it will be a boy! They are doing the nursery in a woodland theme (of course, daddy Eric is a big hunter and fisher dude) so I will have to get busy on an appropriate woodland themed quilt. Eric sent me this picture of Jess last week on an outing to Sams Club. I laughed so hard. I know just how she feels! 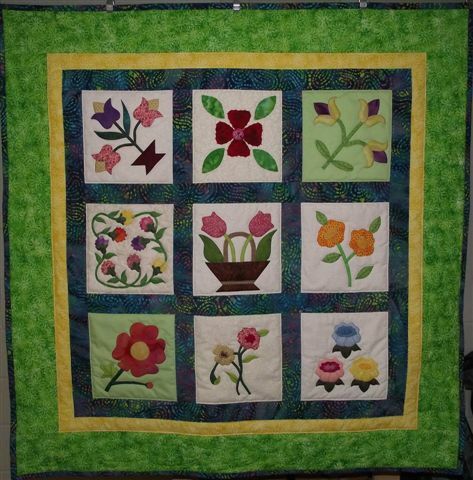 Been working on my Flower Dance quilt and it is nearly done. I have a couple in-progress pictures from the last retreat I was at in Houston in July. This picture is before I put the sashing in. This picture is after I stared adding the sashing. I don't have a DONE picture yet. but should post one shortly. Just putting on the last border this weekend and then it goes to the Quilt Shop to help sell kits. The Countdown to Retirement has begun, and with that in mind, I am becoming re-energized and started designing again. That whole nasty tax thing had me in a blue funk all winter and spring, but with summer I am feeling better, and ready to work on more quilt projects. This week I have been finishing up the blanket stitching on my vintage sampler blocks. I want to have that quilt put together soon so I can start marketing the whole pattern at Quilt Market this year. I posted Block 34 on my BOM Page today – and will be putting out the remaining 8 blocks this June and July. If you have been wanting to complete your collection of all the blocks, they will all be released by August 1. Here are a few of the patterns I am going to be working on. This Iris Quilt will be appearing in THE QUILT PATTERN MAGAZINE Starting in December as a block of the month. If you subscribe to this completely online magazine you will get all the installments as downloadable PDF files. 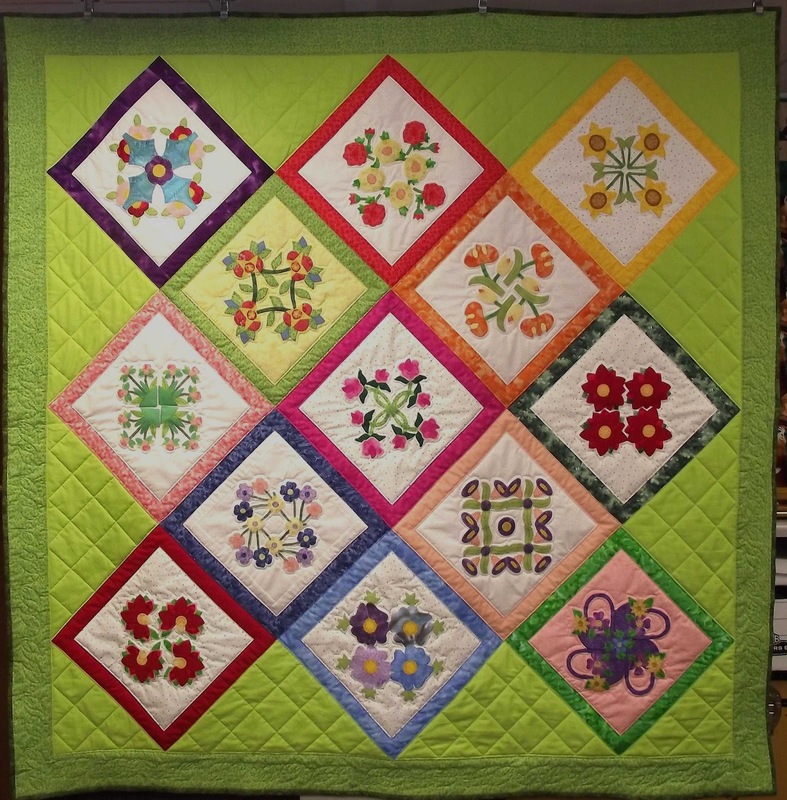 I will offer an alternate applique version of this quilt to my newsletter subscribers next year. I have redesigned the border in my Midnight Posies BOM and it is now available on my website. I wanted a pieced border to make it easier for beginners, who expressed some chagrin about doing an applique vine border. Another new pattern will be another version (or two) of my diamond argyle quilts which were really popular. Two new versions are called Indian Blanket (on top) and Winking Diamonds (the last one). If you have a favorite let me know in a comment and you could win a copy of the pattern! One last thing. My page counter is getting closer every day to 300,000 hits. If you leave a comment on my blog about which of these designs you think I should bring out first, on the day the counter hits 300,000 I will give a free pattern to 10 randomly selected commenters! You can’t lose with a give-away like that!! Thanks for hanging in there with me this year. It has been a tough year for me but it looks like things will be getting better. Thanks for all the wonderful notes and wishes so many of you have sent. Everyone of them was special and helped me overcome a monumental case of the blues. Morning Glory Desigs is now a Dot Com! Patience is a virtue. Or so I am told. Heaven knows I waited a long time for the price to come down on my domain name. I purchased the .net version of my domain name for about $10 in 2006 when I started my business. At that time the .com version was not available. Someone had it, and was parking ads on it. When it came up for sale the next year I offered $15 for it but was outbid at the very last moment before I had an opportunity to counter-offer. Yes, bought up domain names are offered for auction on a lot of sites. So I waited. It appeared on auction for $750. Holy S**t! I was appalled by the hubris of someone looking to make a bazillion % profit on a lousy domain name. I made an offer of $100 which was rejected. I waited. The price continued to grow and I continued to wait. I would make occasional offers, but clearly, I was the only one bidding. The price grew. No competition. I even got phone calls asking me to buy the domain, and would be given a special price. . . $1000 off the price of $3700. I told them to call me when they would sell for $500. That was my top price. They kept calling, I kept saying no, and telling them to call me back when they were ready to get real. I waited. 7 years later they were finally ready to get real and I bought the domain. I lament the days of being able to buy it for $15 but at least I didn't pay anywhere near the absurd asking price of $3700! I understand profit. But this was pure greed. And now a commercial message to interrup my rant on the injustices of the world. Thought you might like to see how much the kitties have grown. Now back to my regularly scheduled rant. One more lament about greed before I go back to work on my design work. . . . Why is it so wrong to have "enough" and not want to strive to have "more and more"? As a business person I understand the need to make money at what I do. But according to the IRS I should be making more money every year. To lose money is the ultimate sin. In fact, according the the IRS, if you lose money 3 years in a row you are NOT A BUSINESS!!! The definition of a business, according to them, is someone who makes money. Why not someone who meets their needs? Who enjoys what they do and shares it with others? Why not make some, lose some, break even? Granted a business person needs to pay their bills. But why the push for more and more and more? Greed is an insipid motivator and clearly it motivates the IRS. Yes, I am still battling with the IRS over my tax audit. Yes my lawyer is likely to cost me more than I would have paid in taxes. Yes, my stress level is still through the roof, and my meds to control my BP are only marginally successful. Yes, I am still mostly unproductive as a result of the stress and resulting anxiety. All because of greed. Is it worth it? I give away free blocks every month and have for the past 5 years. It brings people to my website and results in occasional sales. I am not aggresively marketing my work online because I still have a full time job. When I retire next year I will ramp up my design work and my marketing efforts to offset the drop in the my salary. I have already proven I can do that. I invest in my business, overhead, equipment, supplies and support the industry which supports me. It works for me. But you can't give things away forever. So offering free blocks for a brief period of time, then offering them for sale is a buisness model that works. . . .mostly. Hundreds -- sometimes thousands -- of people download my blocks every month. And a couple even say thank you. I appreciate those folks. Some complain because they missed the free blocks and want them -- for free of course -- because they. . . well, because they want them, and feel they deserve to get them -- for free. I feel your pain. I love getting free blocks too. I had a woman call me, while I was driving through the mountains on vacation, no less, berating me for taking down a free block. She had been ill and just wasn't able to get to the computer to get her free block, and she had all the others, and it wasn't right that she should pay for one when she had gotten all the other ones free, and how could I be so heartless as to deny her the complete set when she had faithfully downloaded all the other for free??? REALLY? I told her she could purchase the missing block for $3 on my website. OMG, I can't do that, she told me, she was on a fixed income, and had medical problems, and was supporting her grandson, six cats and a dog, and there was no money left over for something as unimportant as free quilt blocks! REALLY? 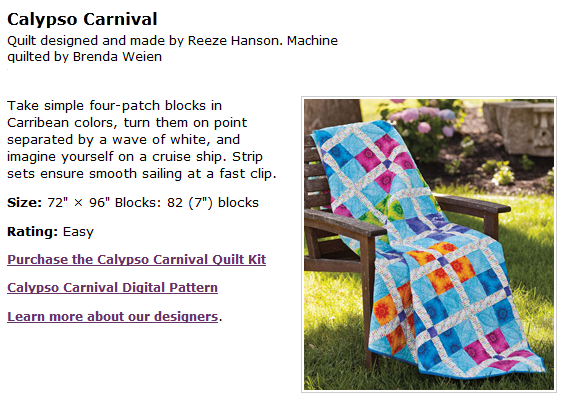 Calypso Carnival Published in the Sping 2013 Fons & Porter Easy Quilts. This is a super fun and easy quilt to make. You can purchase the magazine or buy the pattern via download from F & P's website. They even have a kit put together for the quilt using Ro Gregg's Calypso fabric line! Whoo Hooo. 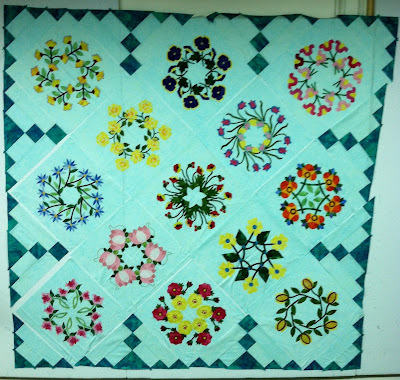 Here is what the quilt looks like opened out. 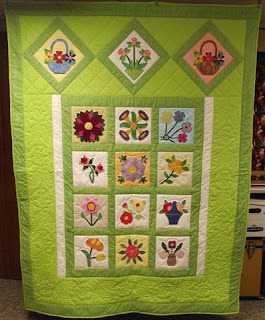 Brenda Weien did a great job of quilting it, as usual and it really glows with all those bright colors. And I like the feel of the quilt with no borders. Wouldn't this make a great quilt for kiddo's room? So now that the last of my quilts have been published I really need to get on the ball and work up some more designs to send in. I have a couple on the fires, but I need to simplify them a bit. Let me ask all of you what you think. 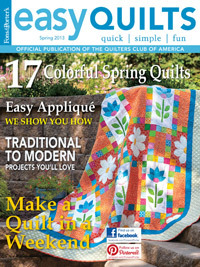 Publishers are telling me that quilters want EASY quilt patterns. I certainly understand that. But how many "boxy block" quilts can one person make without blowing a gasket? OK, what I mean, is what would YOU like to see more of? Pieced? Applique? Combination of both? Bed Quilts? Lap Quilts? Wall Hangings or Table Runners? Modern Fabs? Reproduction Fabs? Scrappy Fabs from your stash? And thanks for following along on this crazy adventure! I love giving away patterns to our winners! And the winner of the free pattern for the F & P Stars and Bars Give away is Comment #17, as chosen by my Random Number Generator. 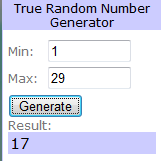 Comment # 17 is Edie! Congratulations Edie, contact me with your full name and email and I will send your winning pattern. Just in case you want to get a bit ahead on the free Block of the Month, I am posting these a bit early. School starts in a few days, and as many of you know, when I get busy with classes sometimes my time gets limited and I don't get the blocks up on time. So while I still have one free weekend before all hell breaks loose on campus, I am trying to stay ahead of the game and posted blocks 24, 25 and 26! Hope you enjoy the extra time to play with these fun blocks. Any suggestions would sure be helpful! I printed off post card backs onto printable fabric but I need to get a stiffener for the middle layer. I am thinking of Timtex. If any of you have done this before please give me some suggestions. I could really use some help on this one.